Years after coming across a few bottles of Pineau d'Aunis by Jean Marie Renvoisé in a shop in Touraine a few years ago, I had decided to visit this vigneron in the outskirts of the charming village of Chahaignes in the Coteaux du Loir/Jasnières region. Before that, I tried unsuccessfully to purchase some of his last vintages in two Paris wine shops where his wines were supposed to be available, but they were sold out in each of the place, and one of these shops (le Cellier des Marchés in the 14th) having otherwise a good selection of wines, I decided to pay a visit to the vigneron without prior additional check of the wine. Chahaignes is close from the nothern-most tip of the Loire Appellation area, this is a tiny wine region of the Loire located near the Loir river (a smaller river compared to the Loire), a region which is slowly making a comeback with its good-valued Chenin and Pineau d'Aunis wines. 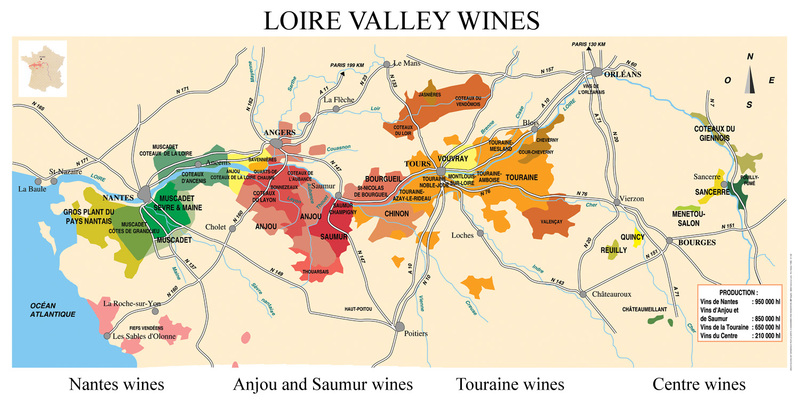 According to the data collected by Richard Kelley in his page about the Loir area wines, the exploited vineyard surface in the Coteaux du Loir Appellation is a mere 76 hectares nowadays, and in Jasnières, 65 hectares. As you may know, the planted surface was much higher before the phyloxera destroyed the European vineyards in the late 19th century, and after then, with the additional competition of railways transportation and the demographic dwindling of the workforce caused by WW1, only a fraction of the original surface was replanted. The vatroom gallery deep inside the hill Jean-Marie Renvoisé, who has deep roots here and several generations of growers behind him, began to make wine on his own in the 1990s'. Prior to that, he had helped his father and grandfather tend the vines and make some wine. His father used to have some vineyards, up to 1,5 hectare, and make some wine on a small scale, like many of the local people around here. Most of this wine was for his family and friends, a small part being sold as vin de table to acquaintances. His grandfgather made more volumes before WW2, selling the wine in casks as at that time families were buying whole casks for their consumption (bottles were rare and casks were foremost convenient containers for delivery). His grandfather was growing both Pineau d'Aunis (red) and Chenin, athough he didn't sell under an appellation at the time. In the 1990s', Jean-Marie Renvoisé began to work from the remnants of the family vineyard surface, about 1,5 to 2 hectares split in Pineau d'Aunis and Chenin Blanc. His family also had some land which was in appellation areas and on good slopes but wasn't planted, so he used his plantation rights to increase the vineyard surface along the years. The family troglodytic cellars used for generations were too small so Jean-Marie found a larger such cellar to rent (pictured on left and right), which belonged to a former pre-war winery making wine from 13 hectares and which closed down in the 1970s' like many other ageing wineries located in an unfashionable appellation. He also bought another cellar next to this one. At the other end of one of the cellars With his initial family surface, some replanting on owned land, some rented rows and a few purchases, Jean-Marie Renvoisé reached a surface of about 6 hectares split between 4 hectares in Jasnières (Chenin), 0,5 hectare of Coteaux du Loire white (Chenin) and 1,5 hectare of Coteaux du Loir red (Pineau d'Aunis). He bottled the wine from the start, selling also wine in bulk locally to make some cash (people coming at the winery to fill 20 or 30-liter containers). The age of the vineyards goes from more than 50 years to less than 10 or 15 years (the later making two thirds of his vineyards). For many years, he says, people didn't replant in the area because the wines didn't sell, so in recent years it appeared necessary to replant. His Pineau d'Aunis is partly near Marçon, partly near Lhomme, and his Coteaux du Loir white (Chenin) is located near Chahaignes while the Jasnières Chenins are in three locations : Clos des Jasnières, Clos de l'Aillerie and Clos des Molières. All these Chenin vineyards are on clay/limestone with a south/south-west exposition on dry slopes where the water doesn't stay. A disused cement vat from the 1930s' This twin cement (the second opening is hidden behind Jean-Marie) was built by Italian masons in the 1930s'. The symbolism and imagery found on this vat with the plant/vine connected to the cement foot of the vat, the horizontal tree trunk linked to the human face above the vat door are not common occurences and even though Jean-Marie doesn't use these vats anymore, I was happy to have a glimpse of these old vatroom tanks in the bottom of the cellar gallery. Speaking of the Pineau d'Aunis, Jean-Marie Renvoisé says that as a red grape with white juice, the resulting wine is usually not very dark, even though the vinification can yield more or less color density. His own Pineau d'Aunis from young vines is light colored with still this particular spicy thing in the mouth, while the old vines make darker, more concentrated wines with red fruits and higher alcohol. When possible (that was not the case for the vintage 2010), Jean-Marie makes two cuvées, one with the young vines and another with the older vines. The yields go from 50-55 hectoliters/hectare for the young vines to about 25 ho/ha for the old vines. Jean-Marie Renvoisé remembers that he was among the first to say that Pineau d'Aunis was a relevant variety worth an effort. A couple decades ago many vignerons were doing their best to hide the Pineau d'Aunis characteristics, trying through certain trick to make the wine look like Gamay or Cabernet, as if they were ashamed of its typical light, translucid red. For him, Pineau d'Aunis had to be vinified as a Pineau d'Aunis, because its authenticity and difference from the other mainstream red varieties was attractive and tasty. For the Pineau d'Aunis, there's a prior maceration, not really carbonic because the grapes are mostly machine-harvested and as a result, destemmed in the vineyard. After the maceration which lasts from 2 to 3 weeks with regular punching of the cap, which also helps keep the temperature in check (he hasn't any temperture-control system yet). The fermentation is done in vats including for the malolactic fermentation, with on some occasions a fermentation in casks for the old vines. He used casks some 20 years ago in that regard but he says one has to be careful because the wood tends to hide the delicate aromas of the Pineau d'Aunis, and the choice of the type of wood is crucial to make something balanced. The élevage is at least 8 months and goes up to 11 months. Speaking of the harvest mode, he says that he used to be opposed to machine harvesting but the technolgy of these machines has improved and he considers that it is possible to have a good result with them. He took shares in a CUMA (a miniature coop where neighboring growers and farmers share costs of heavy machinery) for access to a harvester machine and a mobile bottling line. Jean-Marie Renvoisé doesn't use the press juice for his bottlings, only the free-run juice (jus de goutte). Not that the press juice is really bad but it's just more gross than the free-run and he prefers to sell it separately in bulk, that's the Pineau d'Aunis that people get when they buy in bulk at the winery with their containers. He sells the P.A. in bulk at 2 € a liter, he doesn't have a big volume of it but locals or friends are regular buyers. The wine is lightly filtered on clay. He uses SO2 at small doses to protect the wine, he makes some lab checks to calculate the needed amount of SO2. At harvest, he adds some if the harvest conditions were too warm and risky. The Chenin can ripe very well when the weather allows it, Jean-Marie says. This variety can be vinified beautifully in dry, half-dry, sweet or liquoreux, it can make also nice sparklings. With his Jasnières (Chenin), he usually makes every year a classic dry Chenin along with a half-dry or a moelleux. The Chenin is picked early october usually, sometimes in several times if there's a potential for a late harvest. Pressing takes 2 to 3 hours, Jean-Marie Renvoisé uses 2 old-generation horizontal presses. After the pressing, the must is separated from the juice in vats, then goes to ferment on its fine lees and without any yeast additives, he leaves the indigenous yeasts do their job. He says that a good fermentation must be relatively slow and in that regard, the cool temperature of the cellar (15° C / 16°C) at that time helps. For a dry Chenin the fermentation will last about a month or two in general. It can last longer, up to a year, depending of the sugar concentration in the juice, the wild yeast taking their time in those conditions. The malolactic fermentation are not made on Chenin, usually just through the cool temperature of the cellar, the malo needing higher temperatures to go through. The wine keep this way its vividness. Then, the wine goes through a 5-to6 months élevage on fine lees, with occasional stirring of the lees. Jean-Marie checks the lees first by tasting them to see if they they are devoid of unpleasant aromas. He makes a couple of rackings and will bottle the wines usually around april or may, that is earlier than the reds, after a light filtration. He says that if he was the only one to decide, he would not filter his wines but the market at this stage asks for filtered wines. His Pineau d'Aunis as said above is a nice spicy wine sporting 11,5 ° in alcohol only, a thirst wine and easy drink that we'd like to find more often around. I'm looking forward for when Jean-Marie makes again two cuvées of it, a young vines and an old vines, the latter being more concentrated and fruity, the the former more on the spicy side. As explained before, for the vintage 2009 which is now on the market he found out that the grape conditions didn't allow the best of separate bottlings and opted for a blend of the two wines. The Coteaux du Loir white 2009 is a refreshing dry Chenin with aromas of white flowers, a very good balance and a pleasant drinkability. There's also a very light bitterness somewhere in the back that I like to come across in a white wine. I wish I had bought more to forget a few bottles for a few years and see how they behave. I haven't opened the semi-sweet Jasniéres Chenin that I bought along. THe dry Coteaux-du-Loir Chenin and the dry Jasnières Chenin cost 6 € a bottle. The half-dry Jasnières Chenin that he sells right now has between 15 and 20 grams of residual sugar and cost 8 € tax included here. The Chenin slopes on Jasnières Aillerie After leaving Jean-Marie, I drove to a slope near which he owns a few rows and I shot a few pictures, not necessarily on his own vineyards. The slope here is on Jasnières appellation, with climats going by the name of Le Bénard or Aillerie, there are quite old vines over there, on a soil thick with flint stones (silex). As I was leaving after walking along the vines, I saw an old man walking along the road with his cane, I stopped to ask if he knew which variety the vines were exactly, to which he answered Chenin : the old man happened to be Martial Boutard, a former vigneron who took part after the war (1948 if I remember what he said) in the preparation of the rules for the appellation. He told me that he used to make some 100 casks of Pineau d'Aunis and 200 casks of Chenin every year back then, the wine being sold in casks. He showed me one of the slope, saying that a particular vineyard belonged to him in the past, and that today's vignerons didn't know anymore how to work properly the vineyard. it was quite a coincidence to fall upon this retired vigneron strolling along the road, and with all his life experience, I think there would be here lots to hear from him about how things unfolded in the 20th century for this little-known wine region. Jean-Marie Renvoisé is not farming organic but he uses many of the products used in the organic farming, like organic compost, powedered SO2, Bordeaux mix, and if necessary by the circumstances, he may use what is labelled as chemical products. He works the ground between the rows to control the weeds, but he can occasionally also use weedkillers for certain types of weeds. Plowing the ground with a tractor is good for the microbian life, he says, as well as for the water drainage. Still life in the courtyard Jean-Marie Renvoisé wines can be found in about 6 or 7 wine shops in Paris, like le Cellier des Marchés in the 14th (except that they're sold out these days, and waiting for delivery). Jean-Marie Renvoisé sells about 20 000/25 000 botlles a year but he has a potential of 35 000/40 000 bottles annually, and he sells the remaining volume in bulk to a négoce, expanding the size of his bottlings along his customers needs. Jean-Marie and his wife have two sons aged 11 and 8. Troglodyts and disused cellars The area of Chahaignes is a haven for those interested in the particular field of troglodyts and foothill cellars, troglodyts being constructions made in the side of the hills. Like elsewhere in the Loire, the limestone-thick hills have been dug through a large number of artisanal tuff quarries during the high demographic development of the 19th century. These quarries allowed the construction of all these beautiful houses in the villages. There are some 400 cellars (404 exactly) in Chahaignes, grouped under the name of Caviers du Présidial, cavier des Roches, cavier du Vaugermain, cavier du Pichon, a cavier being a line of cellars. The tuffeau or tuff, a soft, chalk-like type of limestone was extracted from these galleriess which were later turned into cellars and artisanal winery facilities. These Caviers are organized almost like a real house, often with a built-in fireplace like the one you can see near the alcove on a picture above left (shot in Jean-Marie's cellar). A few troglodytic caves in Chahaignes This video was shot a couple hundred meters before reaching Jean-Marie Renvoisé's facility, which happens to be set up on the same foothill (Cavier de Vaugermain), just outside Chahaignes. It is said that there is one such cellar per inhabitant in Chahaignes, most being disused. Looking at this beautiful cave architecture in the silence of the nature, we try to imagine all the activity around there in the 19th century, when literally every family in the village made wine.